Decorative Life: 7-14 days, some types last longer. Plants grown at high (93%) relative humidity lasted longer after harvest compared to those grown at 81 and 70%. Storage at 36-38 F (3 days or less) is fine, 32-34 F (if over 3 days). Stems with well-developed buds may be stored for up to 3 weeks. From Greek “dendron” (tree) and “anthemon” (flower). Many flower forms exist-standards have one flower per stem, spray mums are branched with several flowers per stem. Some form classes are daisy, spider (Fuji), quill, football, pompon, cushion, button and spoon. The “X” in the name means that it is a hybrid between at least two species. The specific epithet name grandiflorum means large flowers. Mums have been cultivated in China for 2000 years, infusions of the leaves and flowers were used as medicine and fermented into wine. The dew collected from the flowers was said to promote longevity. The mum was introduced to Japan in 400 AD and became the emblem of the imperial family. Name was recently changed back to Chrysanthemum X morifolium. It is a short day plant meaning that it will only flower when the days are short and the night long. That is why it naturally only flowers in the fall. At other times of the year the light/dark periods of the day have to be controlled by growers to promote flowering. Mums reached Europe in the late 18th century, where the Chusan daisy became known as the pompon chrysanthemum because it resembled tassels on French sailors’ hats. In Italy, mums are associated only with funerals and death. Some favorite cultivars and their respective flower colors include ‘White Diamond’ (white), ‘Pelee’ (orange and yellow) ‘Shasta’ (white), ‘Regal Davis’ (purple) and ‘Miramar’ (yellow). Appearance of pink/red coloration on petals for cultivars not of this color indicates old flowers and/or flowers grown too cold. Material leaking out of carnation stems held in the same container as mums can often reduce the life of the mums. The Compositae or aster family is vast, with over 20,000 species, and is also one of the most developed families. It was named Compositae because the flowers are actually a “composite” of many individual flowers into one head. Hence, when children pull one “petal” off at a time, saying “she/he loves me, loves me not”, they are actually removing a complete flower, not just a petal. Today, the flower heads, when dried, are used to flavor soups and stews and as coloring for butter. According to Creasy (1999), fresh petals are edible. Can be used in salads and teas or sprinkled over clear soups. Van Gorsel and Ravesloot (1994) showed that a one day interruption at 68F in a 47F cold chain from grower to consumer resulted in a three day loss in vaselife. Using ‘Viking’, Van Doorn and Cruz (2000) showed that in addition to microbe and/or air blockage in stems, a third blockage type apparently involves oxidative reactions that cannot be overcome by cutting under water and/or controlling microbe growth with germicides. Compared to carnations, gardenias, gladioli, orchids and roses, McClary and Layne (1977) showed that the surface of chrysanthemums harbored more bacteria species and higher populations. Van Ieperen et al. 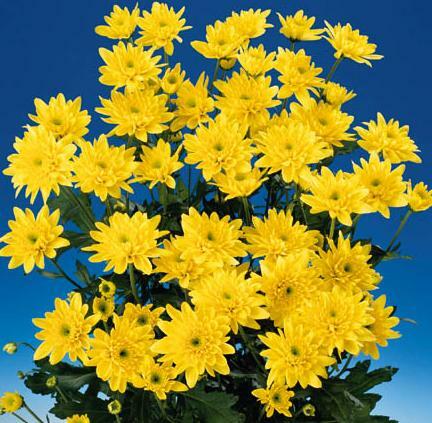 (2002) showed that placing chrysanthemums in deep solutions can help overcome air blockage because of the large diameter vessels in this species.